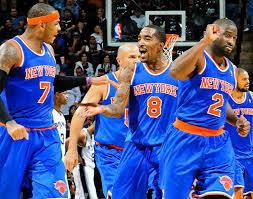 New York's 125-120 victory against the Oklahoma City Thunder was a statement win, and a vociferous one at that. There were those (like myself) who considered the Knicks a threat in the Eastern Conference, but there were few who believed they could make a championship push this year. Their victory over the Thunder (in Oklahoma City, no less) extended the Knicks' winning streak to 12 games, the third-longest stretch of perfection in franchise history. Over the course of the winning streak, New York is averaging 104.2 points per game (second) on 49.6 percent shooting from the floor (second) and 40.9 percent shooting from deep (third). Opponents are scoring just 92.3 points per game on the Knicks (fourth) and they're winning by an average of 12.3 points a night (first). If this were a five- or seven-game stretch, rants supported by "fluke" arguments would have a place. But this stretch is 12 contests, the fourth-longest winning streak in the NBA this season. These Knicks aren't the product of excessive fortuity. They're for real. Six of these victories have come on the road, the last five have come against playoff factions, and three have come over the obnoxiously talented Western Conference. That's not luck. It's called peaking at the right time. New York is the healthiest it has been all season, which is saying something. Why? Because the Knicks haven't been healthy all season. By conventional standards, they're not even healthy now. Amar'e Stoudemire, Rasheed Wallace, Kurt Thomas and Marcus Camby have spent, and continue to spend, ample time on the sidelines. And Kenyon Martin has joined them. And for those who understand what to look for from Tyson Chandler, he's far from 100 percent as well. He's having trouble locating and catching bounce passes, and anything that involves looking over his shoulder isn't as fluid a motion as it should be. Yet the Knicks are winning. A lot. And by a lot. Just in time for the playoffs, too.Seriously. Will they battle their way into the Eastern Conference Finals? Past the Heat? Into the finals? Snag a championship? We can't say that they will, but we also can't say they won't.